Another day, another V-Buck. This week’s Fortnite Week 6 challenge will have you summit 10 different mountain peaks across as many matches as you like. As part of Fortnite’s Week 6 Challenges, players are tasked with clambering up 10 different mountain peaks. Hopefully you have plenty of materials and launch pads. Unlike Fortnite’s Week 5 gas station challenge, this one can be done over different matches, so you don’t need to climb ten mountains in a single match, luckily. The good news is that there are loads of mountain peaks on the Fortnite map, as you’ve no doubt already noticed. Simply look at your in-game map and you will see the poking up. 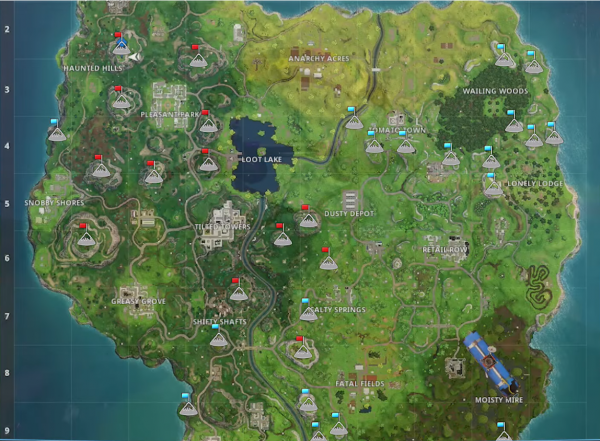 There are mountains everywhere on the Fortnite map. In the Northeast of the map, there are a big cluster of Mountain Peaks surrounding the Wailing Woods. There’s also a cluster of five between Salty Springs and Shifty Shafts. This would be a perfect landing spot if you want to summit a bunch of Mountain Peaks in a single match. There are also two Mountain Peaks to the West of Fatal Fields. From there, there’s a big Mountain Peak to the East of Snobby Shores, and there are three more directly North of that one. Bag all these and you should have enough to complete the challenge. Make sure you finish the match for them to register. For the other big challenge in Fortnite Week 6, here is where to search between a Metal Bridge, Three Billboards and a Crashed Bus. As Fortnite Season 3 slows down, it’s a good opportunity to check to see if you’ve bagged every weekly challenge and Battle Star that you can. Now the wait begins for Fortnite Season 4, which frankly can’t come soon enough.